The Washington Post today ran a story about a trademark infringement lawsuit filed by the American Association for Justice, the group formerly known as the Association of Trial Lawyers of America. See Jeffrey H. Birnbaum, “A Case of Trial Lawyers v. Trial Lawyers,” The Washington Post, November 30, 2007, at D01 (link here). For many years, the Association of Trial Lawyers of America (ATLA) was one of the largest and most politically powerful trial lawyer organizations in the U.S. representing the political interests of its roughly 56,000 members. After years of being the brunt of attacks from politicians and big corporations as an organization of greedy “trial lawyers,” the ATLA decided to change its name to the American Association for Justice (AAJ) (because while politicians and big business can attack an organization representing greedy trial lawyers, they cannot possibly attack an organization dedicated to justice). Around the same time as the name change, however, a man named J. Keith Givens apparently formed a new competing “trial lawyer” organization named The American Trial Lawyers Association (“TheATLA”) and began soliciting AAJ members to join. The lawsuit was filed by the AAJ against TheATLA and J. Keith Givens on November 15, 2007 in the U.S. District Court for the District of Minnesota. See American Association for Justice v. American Trial Lawyers Association et al, Case No. 0:2007cv04626 (D. Minn.). The lawsuit seeks injunctive relief to prevent TheATLA from using the name and confusingly similar acronym. The suit also seeks profits from using the name, treble damages, and attorney’s fees (in “typical trial lawyer fashion” as the WaPo article eloquently notes). AAJ currently holds two registered trademarks for the mark ATLA, both of which issued in 1976: 1) a service mark directed to providing seminars and meetings for attorneys and 2) a collective membership mark indicating membership in the organization. It should be noted that AAJ continues to use the domain name http://www.atla.org/ as its home page. It is interesting that the AAJ fought its own legal battle over its former name many years back. The AAJ adopted its former name only after the American College of Trial Lawyers (“ACTA”) successfully blocked the organization from calling itself the American Trial Lawyers Association – instead settling for the Association of Trial Lawyers of America. TheATLA may have anticipated its own potential battle with the ACTA regarding its name. The WaPo article states that the ACTA filed its own lawsuit to prevent TheATLA from using the name American Trial Lawyers Association. However, federal court records seem to indicate that it was TheATLA that actually filed suit against the ACTA – possibly a declaratory judgment action that its name does not infringe upon ACTA’s name. On November 20, 2007, TheATLA filed a lawsuit in the U.S. District Court for the Middle District of Alabama against the ACTA. See The American Trial Lawyers Association, Inc. v. American College of Trial Lawyers, Case No. 1:2007cv01024 (M.D. Ala.). Perhaps Givens feels that this time around TheATLA will be more successful than the original ATLA was against the ACTA. TheATLA’s battle over its name is also playing out at the USPTO. On March 20, 2007, TheATLA filed two Section 1(b) intent-to-use applications for two different versions of the above name and logo of its organization (here and here). Each application covers association services promoting the interests of lawyers and arranging and conducting educational conferences. The USPTO issued non-final office actions on June 28, 2007, refusing to register the marks under Section 2(d) because of a likelihood of confusion with AAJ’s aforementioned ATLA registrations. Given the obvious likelihood of confusion between ATLA and TheATLA, the only chance of success on the part of TheATLA against AAJ’s registered marks (both in the USPTO and in the federal action) is to argue that that AAJ’s registered ATLA marks should be cancelled under 15 U.S.C. §1064 on the grounds that the marks were abandoned by AAJ when it changed its name. Indeed, TheATLA may have grounds for arguing that the AAJ’s registrations should be cancelled. Under §45 (15 U.S.C. §1127), a mark is deemed to be “abandoned” if its use has been discontinued with intent not to resume such use. The intent not to resume may be inferred from the circumstances and nonuse for 3 consecutive years shall be prima facie evidence of abandonment. The “use” of a mark means the bona fide use of such mark made in the ordinary course of trade, and not made merely to reserve a right in a mark. AAJ made it clear that it will no longer call its organization by its old name – and thus have no need for the acronym ATLA. AAJ will counter by arguing that its website (atla.org) and some other remaining uses of the acronym constitute use of the mark. However, even if TheATLA were successful in cancelling AAJ’s registrations, this does not necessarily translate into TheATLA continuing to use its name, because the organization must still contend with AAJ’s §43(a) grounds for relief. Although AAJ may no longer go by the name Association of Trial Lawyers of America or the acronym ATLA, there is still a long-standing association between the two names and the well-known trial lawyers group. As such, the use of a confusingly similar name and acronym by TheATLA is very much likely to cause confusion or cause mistake, or to deceive the public as to the affiliation, connection, or association of TheATLA with the organization formerly known as ATLA or confusion or mistake as to the origin, sponsorship, or approval of TheATLA by the organization formerly known as ATLA. One thing is for certain – with trial lawyers on both sides, it is sure to be an interesting and contentious case. The Washington Post ran an article yesterday about Dell Inc.’s (“Dell’s”) new “cybersquatting” lawsuit against several domain name registrars. See Brian Krebs, “Dell Takes Cybersquatters to Court,” The Washington Post, November 28, 2007 (link here). The complaint apparently names three domain name registrars – BelgiumDomains, CapitolDomains, and DomainDoorman – along with several alleged Bahamian shell corporations (e.g,, Caribbean Online International, Domain Drop S.A., Domibot, Highlands International Investment, Keyword Marketing Inc., Maison Tropicale, Marketing Total S.A, Click Cons Ltd., Wan-Fu China Ltd. and Web Advertising Corp.) that the registrars supposedly used to act as the companies registering the domains. The suit also names Miami-resident Juan Pablo "JP" Vazquez and alleges that he is connected to the companies. The case was apparently filed in the U.S. District Court for the Souther District of Florida in October, but placed under seal until yesterday. The judge in the case sealed the case while federal marshals seized hard drives and other computer equipment from Vazquez's home on November 9th. The judge also issued a temporary restraining order against the defendants barring them from using the practice of “domain tasting” to make money off of and then deleting any domain names that may infringe upon Dell's trademarks. “Domain tasting” is cyber-squatting business model that came about because of rules established by Internet Corporation for Assigned Names and Numbers (ICANN) which give registrars up to five days to sample domains before actually having to purchase them. This allows these registrars to basically buy up large numbers of domain names, test (or “taste”) their value through pay-per-click ads on the parked domains, and then give up domain names that do not appear to generate enough traffic to provide any value. By purchasing domain names of commonly misspelled web site names, often including registered trademarks (so called “typosquatting”), the domain registrants can often make money on the misdirected web surfers who opt to click on one of the many6 pay-per-click ads rather than retyping the correct domain name address. According to Dell, however, the defendants have been combining “typosquatting” with “domain tasting” by setting up a network of registrar companies that continually purchase and give up infringing domain names so that the companies never have to pay for them all while still profiting from them. The lawsuit cites an example where on May 25, 2007, DomainDoorman registered dellfinacncialservices.com. Five days later, then the register dropped the domain name, the same domain was registered by BelgiumDomains within minutes. Five days later, that company dropped the domain name, only to have it be registered by CapitolDomains. When that company gave it up give days later, the domain was again registered by DomainDoorman. The same approach was done with other such domain names as dellinspirion.com, delloutletcom.com, and dellsuportcenter.com. What has raised interest in this case, however, is that in addition to the standard trademark infringement causes of action, including cybersquatting cause of action under 15 U.S.C. §1125(d), Dell also alleges counterfeiting against the defendants (i.e., that the typosquatting is effectively a counterfeit of the authentic “trademark holder’s domain name”). While federal law allows a court to award damages up to a maximum of $100,000 per domain against cybersquatters, if the same domains are found to constitute counterfeits, then federal law would allow a court to award damages up to $1 million per violation. As for the counterfeiting claim, the court is likely to grant Dell the injunctive relief it wants based on the trademark infringement and cybersquatting claims alone. Dell will also probably be awarded damages on such claims. Should the judge dismiss this novel cause of action, it will be interesting to see if Dell decides to appeal such a decision – either to make some new law or to get a larger damage award. Of course, one wonders whether it would be worthwhile to fight so hard for an additional $900,000 in damages. After all, winning a judgment is one thing, enforcing it is another -- especially where so much of the activity appears to be based offshore. Dell is probably better off spending that money on a campaign to force ICAAN to change its rules to prevent “domain tasting” – or to at least put enough of a price tag on such tasting that the business model would not be as profitable. I will taking a blogging break for the Thanksgiving holiday -- returning Thursday, November 29th (if not sooner). I had a feeling that this one was coming. I have been an avid watcher of Showtime’s new series “Californication” since it first aired back in August. For those not familiar with the show, it stars David Duchovny as a middle-aged writer living in Los Angeles and coping with a mid-life crisis in his own mature-audiences-only way. The title “Californication” is most apropos -- combining fornication, which Duchovny’s character does a lot of in the series, with California, the geographical backdrop of the show. Of course, for anyone between the ages of 20 to 45, the show’s title also brings to mind the famous Red Hot Chili Peppers’ (“RHCP”) song “Californication” from their 1999 multi-platinum album of the same title. New stories were abound today (e.g., here and here) reporting that on Monday, November 19, 2007, the four members of the RHCP filed a lawsuit in Los Angeles Superior Court against Showtime Networks, Inc., Twilight Time Films, Inc.; Aggressive Mediocrity, Inc., and Tom Kapinos (collectively “Showtime”) alleging false designation or orgin under Section 43(a) of the Lanham Act (15 USC §1125(a), unfair competition under California law, trademark dilution under federal and California law, and unjust enrichment arising from Showtime’s use of the name “Californication.” See Anthony Kiedis et al v. Showtime Networks, Inc. et al, Case No. BC 380894 (L.A. Super. Ct.). A copy of the complaint can be downloaded here (courtesy of Past Deadline Blog). Much of the complaint details the “extraordinary critical and commercial recognition” of both the “Californication” album and song. The album has sold over 14 million copies, received two Grammy nominations, was voted by “Rolling Stone” magazine as one of the Top 500 Albums of All Time, and has gone multi-platinum in over 35 countries worldwide. The song has been “legally” downloaded nearly half a million times in the last two years, has been played on domestic radio alone nearly 200,000 times, and received a Grammy nomination. The video for the song has been played over 1500 times in the U.S. alone and was voted by VH-1 as one of the 35th Greatest Videos of All Time. One interesting part of the complaint is that not only does RHCP have a problem with the name of the show, but the group also has a problem with a “compilation CD” of music used on the show put out by Showtime. As such, when a search is done for the name “Californication” (in iTunes for example), this music compilation appears alongside the album and songs of RHCP. RHCP is also fighting with Showtime in the USPTO over the title of the series. On April 10, 2007, Showtime filed a Section 1(b) application to register the mark CALIFORNICATION (for entertainment in the nature of an on-going comedy series). The mark was published for opposition on October 2nd. RHCP have filed an extension of time to file an opposition (link here) – currently due January 30, 2008. There are a few obvious flaws with the complaint (nothing that a First Amended Complaint can’t fix – if this dispute goes that far). The second claim for relief is supposed to be for unfair competition under California law – but instead, the complaint copied and pasted the Lanham Act section – without changing the relevant cites. In addition, the complaint cites to Section 43(a) as the basis for federal dilution – rather than Section 43(c) of the Lanham Act. Furthermore, the language of the dilution seems to pattern the false designation of origin section rather than addressing the specific factors that must be proven under 15 U.S.C. §1125(c)(1). Prediction #1: Confidential out-of-court settlement. In the RHCP’s favor – strong mark and likelihood of confusion. In Showtime’s favor – First Amendment and Fair Use. The parties should just reach an amicable settlement and let the show’s creators (the lawsuit identifies Kapinos as the creator, writer and executive producer of the show) get back to creating what is arguably one of the best new shows on TV. “Californication” is to Showtime what “The Sopranos” was to HBO – a quality series with some themes, scenes, and dialogue that could not be aired on mainstream television, but which make you want to subscribe to the pay-channel just to watch. And while it may be awkward to rename the show after such a stellar first season (the name encapsulates so much about the theme of the show), the writing is so good that you could call this show anything and it would be just as good (how about “The Showtime Adult Comedy Formerly Known as Californication”?). Prediction #2: And the Golden Globe for Best Television Comedy goes to . . .
What ever happened to “What Happens In Vegas Stays In Vegas”? In reviewing some of the pending oppositions (or extension of time to file oppositions) filed by the Las Vegas Convention and Visitors Authority against businesses with trademark applications that are some play on the WHIVSIV slogan (click here to see the list), I got to wondering about the status of the trademark dispute that started it all. For those not familiar with the history of the WHIVSIV slogan, R & R Partners Inc. (“R&R”), a big powerhouse advertising and public relations firm in Las Vegas, came up with the ad slogan “What Happens Here Stays Here. Only Vegas.” (“WHHSH”) for the Las Vegas Convention and Visitors Authority (“LVCVA”). 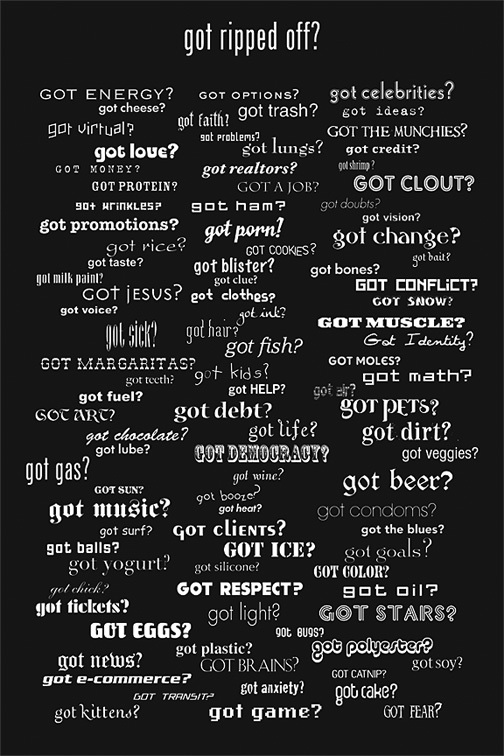 The slogan quickly gained in popularity thanks in part to ads which first ran on TV in February 2003. From there, the slogan took on a life of its own as it morphed into “What Happens In Vegas Stays In Vegas.” The WHIVSIV phrase could be heard in TV shows, movies, and news stories about Las Vegas. Steve Friess wrote a good article for the Chicago Tribune and Boston Globe back in 2004 titled “A firm hits jackpot on Las Vegas ads” about how the WHIVSIV phrase entered into the public lexicon. The only problem is that neither R&R or LVCVA sought to apply for registration of its WHHSH slogan on the USPTO’s principal register. An enterprising lady named Dorothy Tovar, however, saw the commercial potential with the WHIVSIV phrase, and on February 28, 2003, filed two Section 1(b) intent-to-use applications with the USPTO to register the WHIVSIV mark for shirts and for underwear, sleepwear, and headwear. R&R and LVCVA discovered Tovar’s use of the WHIVSIV slogan in selling T-shirts as well as her trademark applications, and on March 22, 2004, filed suit against Tovar and her company, Adrenaline Sports, Inc., in the U.S. District Court for the District of Nevada. See R and R Partners, Inc. v. Dorothy L. Tovar, Case No. 3:04-cv-00145-LRH-PAL (D. Nev.). On the same date, R&R filed its own trademark applications for WHHSH (for public relations). While the case was proceeding, Tovar’s two applications registered, respectively, on March 8, 2005 and August 16, 2005. While there were news stories back in August 2006 (see here and here) that announced that Tolar had lost on summary judgment, the actual judgment did not get filed until May 17, 2007. The court’s order can be downloaded from the TTAB (link here) – where a copy of the judgment was included in a TTAB status report response. What I find interesting is that this judgment does not appear to have registered on the mainstream media’s radar screen (not like the judge’s determination back in August) – a little like a criminal being found guilty, but no one cares about the actual sentence given. District Court Judge Larry Hicks apparently found that Tovar did not have the right to register the WHIVSIV mark and ordered her two registrations cancelled and five pending applications abandoned. The court also ordered her Nevada and California state trademark registrations cancelled. The court enjoined Tovar from selling any goods or services using the WHIVSIV mark, ordered her to remove all goods with the mark, and ordered her to transfer any domain names incorporating the WHIVSIV mark to LVCVA. Finally, the court ordered $81,258.90 in damages and $33,228.32 in costs, with post-judgment interest rate of 4.93%. Tovar filed an appeal of the decision to the Ninth Circuit on May 21, 2007. See R&R Partners, Inc., et al v. Tovar, et al, Case No. 07-15928 (9th Cir.). However, Tovar does not appear to be expeditiously prosecuting the matter. She filed a motion to extend time to file her opening brief to October 6, 2007, which was granted (and extended to October 9th). However, it appears from the case docket that Tovar never filed her opening brief and R&R/LVCVA have filed a motion to dismiss for failure to prosecute. Based on the district court’s judgment, Tovar’s two registrations have been canceled (as of October 1, 2007) and her remaining applications, to the extent they had not already gone abandoned, have been abandoned (although there is one still live – due either to the PTO’s backlog in canceling it or perhaps because this application was not explicitly mentioned in the court’s order, although such order did include catch-all order requiring Tovar to abandon all other federal and state applications). While the battle continues at the Ninth Circuit, Tovar continues to fight LVCVA on another front. Tovar and another company, SanSegal Sportswear, Inc. (“SanSegal”), each filed oppositions (Opposition No. 9117036 and Opposition No. 91170135) against R&R’s trademark application for WHHSH on March 29, 2006. While Tovar’s opposition is suspended pending the outcome of the Ninth Circuit appeal, SanSegal continues its fight to oppose registration. R&R is currently seeking summary judgment before the TTAB. The fight over WHIVSIV and WHHSH continues. I felt like writing about something different today, and found myself perusing some of the recently filed TTAB oppositions against Las Vegas-based companies. Treasure Island Corp. (“TI”), the owner of the Treasure Island Hotel & Casino, is seeking to register the mark THE BUFFET AT TI AMERICA'S FAVORITE DISHES (stylized) (pictured above) for restaurant, bar, and lounges services. On October 24, 2007, Uncommon Grounds Enterprises, Inc. (“UGE”) filed an opposition against the registration of TI’s mark on the grounds of likelihood of confusion over its registered mark, DISHES (for restaurant services). See Uncommon Grounds Enterprises, Inc. v. Treasure Island Corp., Opposition No. 91180307. UGE owns a chain of four “Dishes” restaurants in the New York City area. UGE’s mark was registered on January 18, 2000, and a §15 Declaration of Incontestability was acknowledged by the USPTO on September 22, 2005. This is apparently not the first time that TI and UGE have crossed paths. According to UGE’s opposition, TI once used the name DISHES for TI’s buffet, but stopped after receiving a cease and desist from UGE. In addition, this is not the first time that UGE has sought to oppose TI in the registration of a mark. When TI previously sought to register the mark DELICIOUS DISHES (sylized), UGE filed an extension of time to oppose the mark. However, another party, Dish D'Lish, Inc., the owner of the mark DISH D’LISH, filed an opposition first. TI eventually withdrew the application and the opposition was dismissed. While one can see why Dish D’Lish may have had reasonable grounds for opposing TI’s application for DELICIOUS DISHES, I question UGE’s current opposition of TI’s mark based on a likelihood of confusion. 1. The similarity or dissimilarity of the marks in their entireties as to appearance, sound, connotation and commercial impression. 2. The similarity or dissimilarity of and nature of the goods or services as described in an application or registration or in connection with which a prior mark is in use. 3. The similarity or dissimilarity of established, likely-to-continue trade channels. 4. The conditions under which and buyers to whom sales are made, i.e. "impulse" vs. careful, sophisticated purchasing. 5. The fame of the prior mark (sales, advertising, length of use). 6. The number and nature of similar marks in use on similar goods. 7. The nature and extent of any actual confusion. 8. The length of time during and conditions under which there has been concurrent use without evidence of actual confusion. 9. The variety of goods on which a mark is or is not used (house mark, "family" mark, product mark). 10. The market interface between applicant and the owner of a prior mark: (a) a mere "consent" to register or use; (b) agreement provisions designed to preclude confusion, i.e. limitations on continued use of the marks by each party; (c) assignment of mark, application, registration and good will of the related business; (d) laches and estoppel attributable to owner of prior mark and indicative of lack of confusion. 11. The extent to which applicant has a right to exclude others from use of its mark on its goods. 12. The extent of potential confusion, i.e., whether de minimis or substantial. 13. Any other established fact probative of the effect of use. 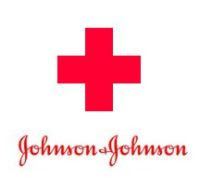 The TTAB is likely to find the first factor dispositive of the case. See, e.g., Truescents LLC v. Ride Skin Care, L.L.C., 81 USPQ2d 1334 (TTAB 2006) (TTAB determined no likelihood of confusion based on the obvious dissimilarities of the marks for identical goods). As such, I will save the first for last. With respect to the second factor both marks are directed to identical goods (restaurant services), so the this factor favors UGE. With respect to the third factor, neither party has any restriction or limitations on trade channels or classes of consumers in their respective descriptions of services. As such, the TTAB will presume that the services are offered in all normal channels of trade to all the normal classes of consumers for such services. Any argument about UGE’s restaurant services being limited only to the New York area is rebutted by the mark’s presumption of an exclusive right to nationwide use regardless of the actual extent of use. See Section 7(b) of the Trademark Act (15 U.S.C. §1057(b)). While TI’s restaurant services are likely to be limited to its Las Vegas location and UGE restaurant services are currently limited to the New York City metro area, the fact is that UGE could open a restaurant in the Las Vegas area. In such case, there would be overlap in the channels of trade. With respect to the fourth factor, restaurant consumers could easily be prone to source confusion if the marks are sufficiently similar. As such, this factor depends on the outcome of the first factor (discussed below). With respect to the fifth factor, UGE asserts in its opposition that its marks are “famous.” Of course, UGE does not cite any evidence to back up this claim. While “famous” for purposes of likelihood of confusion is not the same as “famous” for dilution (in which case UGE would have no claim of fame whatsoever), such claim to fame still requires a company to show a level of fame similar to what has been found to be “famous” with respect to other consumer products. See Recot, Inc. v. M.C. Becton, 214 F.3d 1322, 54 USPQ2d 1894 (Fed. Cir. 2000); Kenner Parker Toys Inc. v. Rose Art Industries, Inc., 963 F.2d 350, 22 USPQ2d 1453 (Fed. Cir. 1992). Without seeing any figures regarding UGE’s advertising and sales, UGE likely can, at most, maintain that its mark is strong. How strong though is questionable. A Google search did not reveal much about this restaurant. Surprisingly, it does not appear to even have its own website. Of course, not having a website does not mean the mark identifying the restaurant can’t be famous – but one would expect a “famous” restaurant would be one that is at least talked about by others on the Internet. All I could find were a few sites reviewing the restaurant (here and here). So, with all due respect to UGE, the DISHES mark seems “weak” (but not “very weak”) and as such, is entitled to a restricted range of protection, especially given its merely suggestive nature in light of the services described in the mark’s registration. With respect to the sixth factor, there does appear to be other restaurants using a name similar to UGE’s mark for restaurant services. A quick Google search showed at least two other restaurants using a name similar to UGE’s mark for restaurant services: Dishes Restaurant (in Hartford, CT) and Little Dishes. While this is not a large amount, it does show that there are other restaurants out there using a mark that more closely resembles UGE’s mark than does TI’s proposed mark. This factor slightly favors TI. With respect to the seventh and eighth factors, UGE does not cite any evidence of actual confusion. Of course, such absence of evidence of actual confusion could be due to scope of use of both UGE’s mark and TI’s mark – the former being concentrated mostly in the New York area while the latter is primarily in the Las Vegas area. Because of the lack of any significant opportunity for actual confusion to occur, the absence of actual confusion is typically considered of little probative value. Of all the factors, however, the one that is probably most significant to this case is the very first factor – similarity or dissimilarity of the marks in their entireties as to appearance, sound, connotation and commercial impression. On the one hand, UGE’s mark is not very strong, which normally requires the registrant to show a strong similarity between the two marks to support a finding of likelihood of confusion. See Westward Coach Manufacturing Co. v. Ford Motor Co., 388 F.2d 627, 634 (7th Cir. 1968), cert. denied, 392 U.S. 927 (1968). However, where the goods and services at issue are identical (as is the case with UGE and TI), the degree of similarity between the marks necessary to support a finding of likelihood of confusion is less than it would be if the goods were not identical. See Century 21 Real Estate Corp. v. Century Life of America, 970 F.2d 874, 23 USPQ2d 1698 (Fed. Cir. 1992). The test for similarity is whether the marks are sufficiently similar in terms of their overall commercial impression that confusion by the average consumer (who normally retains general impressions of trademarks) as to the source of the services offered is likely to result. Most importantly, however, is that while the marks are considered in their entireties, one feature of a mark may be more significant than another, and courts may give more weight to such dominant feature in determining the commercial impression of a mark. See In re Chatam International Inc., 380 F.3d 1340, 71 USPQ2d 1944 (Fed. Cir. 2004); In re National Data Corp., 753 F.2d 1056, 224 USPQ 749 (Fed. Cir. 1985). In terms of appearance, sound, and meaning, the two marks are very dissimilar. The overall commercial impression of TI’s mark in association with restaurant services is that of a buffet which serves popular American “food dishes.” While UGE notes that the PTO required TI to disclaim the words “America’s Favorite” and “Buffet” apart from the mark as shown, this does not change the overall commercial impression that the mark, as used by TI, gives to the average consumer. Accordingly, I say that this factor favors TI. While there is still enough ambiguity surrounding UGE’s opposition that some surprise evidence might come to light which changes the balance of the aforementioned likelihood of confusion analysis, a consideration of all the relevant factors, particularly the “weakness” of UGE’s mark and the dissimilarity between the two marks, tends to favor a finding of no likelihood of confusion. All that remains to be seen is whether TI will go forth with this battle – or just change the name of its buffet (which is not uncommon amongst Las Vegas hotels). Now I know where I'm going to be eating Thanksgiving Day. I’m opting today to let other blogs relay the details of the Fourth Circuit’s decision in the Louis Vuitton trademark infringement and dilution lawsuit against Haute Diggity Dog over its Chewy Vuiton dog toys. See Louis Vuitton Malletier S.A. v. Haute Diggity Dog, LLC, No. 06-2267 (4th Cir. November 13, 2007). Click here for the decision. The Filewrapper Blawg has a nice write-up (link here), but even they recognize the efforts of Rebecca Tushnet’s 43(B)log postings (link here). Conclusions: 1) a good parody, even one that becomes a recognizable mark in itself, can be a defense against both trademark infringement and dilution; and 2) a mark’s strength can actually be a weakness in the face of a good parody. In a day when the hot story in the trademark universe was the first day of the trial of the Tiffany-eBay spat over counterfeit Tiffany merchandise sold on eBay (see stories by AP and Wall Street Journal), here is a trademark infringement lawsuit story about which one can actually smile. On November 12, 2007, Eat ‘N Park Hospitality Group, Inc. and EPR Investments, Inc. (“Eat 'n Park”) filed a lawsuit in the U.S. District Court for the Western District of Pennsylvania against The Clever Cookie Corp. (“Clever Cookie”) for trademark infringement and trademark dilution. See Eat ‘N Park Hospitality Group, Inc. v The Clever Cookie Corp., Case No. 2:2007cv01534 (W.D. Penn.). Eat ‘N Park, a franchise restaurant chain with nearly 100 locations in Pennsylvania, Ohio, and West Virginia, holds a registered trademark for a smiley face design for cookies (see above). Eat ‘N Park filed for the design mark on August 18, 1992, but claimed first use in commerce going back to November 1985. Eat ‘N Park had to argue acquired distinctiveness under §2(f) in order to overcome the PTO’s rejection that the mark was merely ornamental on such goods (cookies) and not an indicator of source. 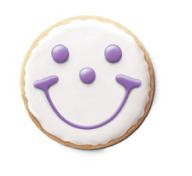 In addition to arguing that the smiley cookie had been used as a mark continuously for the five years preceding the application, Eat ‘N Park submitted evidence showing its advertising expenditures for the smiley cookie in connection with the Eat ‘N Park restaurant chain. The mark was registered on the Principal Register under §2(f) on December 7, 1993. Eat ‘N Park filed a §15 Declaration of Incontestability on April 19, 1999. Clever Cookie is a Plainview, New York cookie company specializing in selling certified kosher cookies for unique events, holidays, birthdays and other special occasions (e.g. logo cookies, press release cookies, etc.) online and through catalog sales. Eat ‘N Park claims in its lawsuit that Clever Cookie is selling a cookie that is “confusingly similar” to Eat 'n Park’s smiley face cookie. 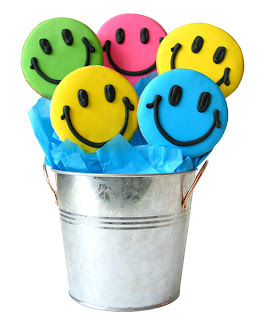 Click here to see the likely “infringing article” (pictured below) -- Clever Cookie’s “Smiley Face Planter” with “five delicious, smiley face cookies." Eat ‘N Park’s case does seem compelling at first. The only difference between Clever Cookie’s smiley cookies and Eat ‘N Park’s smiley cookies is the additional dot of frosting in the middle of the cookie to make the smiley’s nose (not a significant difference). However, if you look at Clever Cookie’s smiley cookie, it actually seems more to resemble the famed “Have a happy day" Smiley (pictured below) than Eat ‘N Park’s smiley. In addition, bakeries across the United States bake and sell similar “smiley face” cookies – is Eat ‘N Park’s going to start sending cease and desist letters to them all? Perhaps the fact that Clever Cookie is selling these online and through catalogs may have something to do with Eat ‘N Park’s enforcement efforts. Still you have to wonder whether most consumers who see Clever Cookie’s smiley cookies will be confused into thinking that they are Eat ‘N Park’s smiley cookies – or will they simply bring to mind the “Have a happy day" Smiley. Analyzing the likelihood of confusion factors, most of the factors tend to favor Eat ‘N Park – related goods, similar marketing channels, similar marks, consumers not likely to exercise a high degree of care with respect to cookies. It was probably not Clever Cookie’s intent to pass off its cookies as Eat ‘N Park’s smiley cookies, but rather to sell cookies invoking the Have a happy day" Smiley. So it all comes down to the strength of Eat ‘N Park’s smiley mark, which I think is drawn in to question given the fame of the other smiley logo. While the uncertainty surrounding likelihood of confusion may be why Eat ‘N Park is also pursuing trademark dilution as well, such claim has its own uncertainties. Under the current Trademark Dilution Revision Act (“TDRA”), Eat ‘N Park’s mark would not be deemed “famous” because it is not “widely recognized by the general consuming public of the United States as a designation of source of the goods or services of the mark’s owner.” Although the district court is in the Third Circuit, the court is likely to follow the Second Circuit's lead, which applied the TDRA to a claim for injunctive relief by Eat ‘N Park. See Starbucks Corp. v. Wolfe's Borough Coffee, Inc., 477 F.3d 765 (2nd Cir. 2007). However, to the extent that Eat ‘N Park seeks damages for cookies first sold by Clever Cookie before October 6, 2006 (the effective date of the TDRA), the court is likely to apply the standards of the Federal Trademark Dilution Act (FTDA), which requires Eat ‘N Park to prove actual dilution, but also may allow Eat ‘N Park to get away with showing that its smiley mark is famous within its “niche market” (which it probably is pretty certain given Eat ‘N Park’s regional notoriety in the Ohio, Pennsylvania, and West Virginia area). So Eat ‘N Park finds itself in an unusual situation. The Company will not likely be able to get an injunction on dilution grounds under the TDRA, but may be able to get damages under the FTDA (if actual dilution is shown). 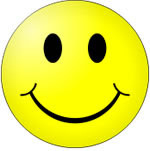 I must add that all this talk about the “smiley face” logo reminded me of Franklin Loufrani, owner of SmileyWorld (based in London), and owner of the rights to the yellow-smiley logo in over 80 countries. But not in the United States, where he has been embroiled in controversy over the logo since June 3, 1997, when he filed two Section 1(b) applications for “Smiley” (here and here) for a wide range of good and services, although interestingly enough, not cookies. One of his applications is currently part of an opposition ongoing since 2003. See America Online, Inc. v. Loufrani, Opposition No. 91156646. In addition, Loufrani himself has filed several oppositions against other applicants seeking to register either the word SMILEY or a logo similar to smiley (see list of pending TTAB cases here). Most notably is Loufrani’s opposition to an application by Wal-Mart’s to register its smiley face logo for retail department services, which was widely publicizing in many newspapers and blogs (see articles in NYTimes and Forbes). See Loufrani v. Wal-Mart Stores, Inc., Opposition No. 91152145 (Filed July 23, 2002). Both oppositions are ongoing and any TTAB decision will certainly be appealed to the Federal Circuit. What's left to say ? Have a Happy Day !! Starbucks suing another small coffee shop over logo. I half expected Seattle Trademark Lawyer to cover this one before me – never one to miss a story about Seattle-based coffee behemoth Starbucks threatening to file trademark infringement lawsuits against mom-and-pop coffee shops using a name or logo similar to the Starbucks name or famed green encircled siren logo (pictured above – not that you didn't already know what it looked like). Click here to read STL's many blog posts on Big-Green’s past trademark enforcement efforts (with mixed results). This current story has apparently been brewing (pun intended) since late October. New stories ran in The Macomb Daily on October 28th and in the Detroit Free Press on the 9th. On October 22, 2007, Conga Coffee & Tea (“Conga”), a coffee shop in Mt. Clemens, Michigan, apparently received a cease and desist letter from counsel for Starbucks Coffee Co. (“Starbucks”) about Conga’s logo – a green circle with a black elephant silhouette in the middle (pictured below). Conga is owned by Michael Dregiewicz, who purchased the 11-year-old store back in February. 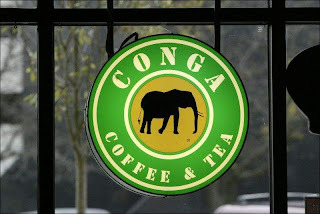 Starbuck’s counsel, Hope Shovein of Brooks Kushman, P.C., stated in her letter to Dregiewicz that Conga’s logo is "likely to cause consumers to think that Conga is an authorized licensee of Starbucks." The letter gives Conga a two week deadline to stop using the logo or face legal action. The letter also states that Starbucks is willing to negotiate a reasonable phase out the logo. Dregiewicz has hired Melanie Frazier, of Romain, Kuck & Egerer, P.C., to defend Conga’s use of the logo. Dregiewicz has estimated the cost of changing his logo would cost up to $5,000 for reprinting business cards, paper cups, and other products as well as changing the store’s awnings. If Starbucks chooses to file an infringement action, it will likely include both infringement based on likelihood of confusion (under §32 and/or §43(a)) as well as trademark dilution by blurring under §43(c). With respect to the possibility of Starbucks using a §43(c) dilution claim against Conga, I’ll defer to “dilution-guru” Michael Atkins for comments. Check out his recent post entitled “How Courts Have Interpreted the Trademark Dilution Revision Act” on the uncertain status of trademark dilution jurisprudence. Perhaps Starbucks may have been emboldened by its recent victory by the Second Circuit in Starbucks Corp. v. Wolfe’s Borough Coffee, Inc., 477 F.3d 765 (2nd Cir. 2007), where the court applied the Trademark Dilution Revision Act of 2006 (with its likelihood of dilution standard) rather than the Federal Trademark Dilution Act of 1996 (with its actual dilution standard) to Starbuck’s injunctive relief claim. If the new standard applies in the 6th Circuit, Starbucks may have an easier case to make for dilution by blurring than it would if it had to prove actual dilution. If Starbucks chooses to pursue dilution, one wonders if Conga’s use in commerce of its logo was before Starbuck’s logo became famous? Conga has apparently been using its logo for 11 years, which would put its initial use in commerce around 1996. While Starbucks was founded in 1971 and went public in 1992, the current incarnation of Starbuck’s famous logo was applied for federal registration on January 15, 1993 – a Section 1(a) application claiming date of first use as August 30, 1992 for retail services (among other goods and services) with the color green claimed as a feature of the mark. 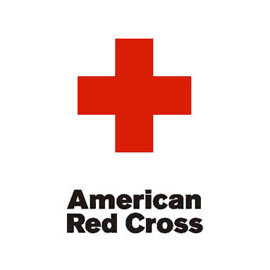 The logo was registered on January 11, 1994. It is very likely that Starbuck’s logo became famous during this four year time period before Conga started using its logo, but it is an issue nonetheless. As for likelihood of confusion, Starbucks undoubtedly has a very strong mark and the services at issue are identical. As such, there is a greater likelihood that the public may mistakenly assume an association between Starbucks and Conga. The greater the likelihood that the public may make such an association, the less similarity that is required among the marks to find likelihood of confusion. The issue will come down to similarity of the marks, in particularly the visual similarity of the two logos. On the one hand, when you look at the logos side-by-side, there is very little similarity other than the green circle. However, if you are driving around and you notice a round green logo, you may be confused into believe that it is a Starbucks (until you get close enough to see the sign, in which case you drive another block to the actual Starbucks – there is one on every corner after all). In addition, coffee drinkers, especially Starbucks loyalists, do exercise some degree of care when it comes to getting their Starbucks-fix, and thus I do not think that they would be confused into thinking that Conga is somehow going to provide them the same “decaf Grande half-soy, half-low fat, iced vanilla, double-shot, gingerbread cappuccino, extra dry, light ice, with one Sweet-n'-Low and one NutraSweet” (the famed Starbucks Test) that they have come to expect from Starbucks. Then again, I’m sure there are those mornings when consumers are so desperate for their java that they may head towards the closest “Green circular logo” they can find. But in Mt. Clemens, Michigan? On November 5, 2007, the Ninth Circuit Court of Appeals issued its decision in PerfumeBay.com, Inc. v. eBay Inc., No. 05-56794 (9th Cir. Nov. 5, 2007). A copy of the decision can be downloaded here. A good summary of the decision can be found on the Filewapper Blawg (link here). Another posting can be found here from the law firm that argued the case on behalf of eBay at the district court and before the Ninth Circuit. The Ninth Circuit mostly affirmed the district court’s decision, which held that a) Perfumebay’s use of the mark “Perfumebay” was likely to cause confusion with eBay’s name; b) Perfumebay should be enjoined from using the domain names perfumebay.com and perfume-bay.com; and c) Perfumebay’s use of "Perfume Bay" (not conjoined) was not likely to cause confusion (even though, as discussed below, it may be likely to cause dilution). However, the Ninth Circuit reversed the district court’s decision of no likelihood of dilution under California law finding that the district court applied the applicable test for dilution too narrowly. eBay argued at the district court that online retailers using names that combine a generic word for the goods or services sold with the suffix “Bay” (CarBay, AutoBay, RentBay, JewelryBay, EventsBay, and, of course, PerfumeBay) diluted eBay’s famous mark and threatened to make the suffix "Bay" synonymous with “online marketplace.” However, in denying eBay’s dilution claim, the lower court determined that eBay’s famous mark was not “nearly identical” to “PerfumeBay.” In reversing this decision, the Ninth Circuit found that the lower court had not considered the “highly distinctive” qualities of eBay’s famous mark in determining whether the marks were “nearly identical.” The court held that there was a likelihood of dilution given a) the “distinctiveness and fame” of the eBay mark, b) the strong recognition and association of eBay’s mark with its services, c) the presence of the dominant suffix “Bay” in the PerfumeBay mark, and d) both parties use the Internet to sell similar products. To the extent that online retailers such as PerfumeBay use the ‘Bay’ suffix in it name, consumers may no longer associate the usage of the ‘Bay’ suffix with eBay’s unique services, which would dilute the uniqueness of eBay’s mark. The owner of PerfumeBay, Jacquelyn Tran, has her own blog, MakesNoScents, where she says she will continue fighting eBay by seeking an emergency stay of injunction as well as appealing to the Supreme Court. According to PerfumeBay’s court papers, Tran’s selection of the name PerfumeBay was not meant to confuse or deceive customers into believing her company was affiliated with eBay. Rather, she chose the name because it evoked an image of “a bay filled with ships importing perfumes from all parts of the world.” But the district court noted that Tran’s website did not contain any pictures of ships or a Bay or anything suggesting perfume-filled ships. Tran even admitted that some consumers called her asking if she was affiliated with eBay. One part of the decision that seems a little inconsistent is that the court would affirm the injunction against the domain name perfume-bay.com, but also affirm the finding of no likelihood of confusion for the name Perfume Bay (with a space between the two words). The dash in the domain name serves the same purpose as a space in the Perfume Bay name, and yet this domain name was found to be likely to confuse. To the extent that Ms. Tran should be enjoined from using this particular domain, it should probably be on grounds of dilution rather than likelihood of confusion. Of course, eBay will now get to go back to district court to make its case for dilution against PerfumeBay – an argument that the Ninth Circuit appears to have wholeheartedly endorsed. On November 2, 2007, Hallmark Cards, Incorporated (“Hallmark”) filed its Rule 12(b)(6) Motion to Dismiss for failure to state a claim upon which relief can be granted against Paris Hilton’s right of publicity and trademark infringement lawsuit over a Hallmark greeting card that used her image and her registered trademark “That’s Hot” (the “Card”) (Vegas™Esq blogged here). A copy of the motion can be downloaded here (courtesy of pitch.com). The filing gave news reporters today great fodder for witty headlines. See MSNBC (“Hallmark thinks Paris’ lawsuit is not hot”), the Post Chronicle (“Hallmark Cold To Paris Hilton Over "That's Hot" Lawsuit”), Entertainmentwise.com (“Hallmark To Paris Hilton: 'You're A Publicity Seeker! '”), and Glosslip.com (“Hallmark: When You Care Enough To Make Fun Of Paris Hilton”). From the very first paragraph of Hallmark’s Memorandum of Points and Authorities (“Memo”), Hallmark comes out with guns blazing: “Paris Whitney Hilton (‘Hilton’) is a privileged, jet-setting heiress to the Hilton family fortune, the center-of-attention ‘celebutante’ at the most lavish parties and exclusive events, and a consummate self-promoter who, by her own admission, considers working ‘manual, low-paying jobs’ and serving the public to be her ‘private nightmare.’” Memo at 1. Hallmark seeks to dismiss Hilton’s claims for misappropriation of her common law right of publicity, false designation of origin, and federal trademark infringement. Hallmark’s primary argument is that its greeting cards constitute expression protected by the First Amendment. Hallmark cites to Tenth Circuit’s decision in Cardtoons, L.C. v. Major League Baseball Players Assn., 95 F.3d 959 (10th Cir. 1996) which found parody baseball cards to be protected speech. Hallmark argues that its greeting cards are just as expressive if not more so than trading cards and that greeting cards have been recognized as “the embodiment of humor, praise, regret or some other message in a pictorial and literary arrangement.” Memo at 8. Hallmark characterizes the Card as “not only entertainment and parody, but also social commentary and criticism of Hilton’s lifestyle and belief system.” Id. With respect to Hilton’s common law right of publicity claim, Hallmark argues that its use of Paris Hilton’s name and likeness was not for a commercial purpose (i.e. advertising, endorsements, or commercials) as required to state a right of publicity claim, but rather expressive speech (citing Cardtoons). Hallmark then goes through a long discussion regarding the “transformative use” test to “determine whether a work merely appropriates a celebrity’s economic value, and thus is not entitled to First Amendment protection, or has been transformed into a creative product that the First Amendment protects.” Winter v. DC Comics, 30 Cal. 4th 881, 888 (2003). In short, the use of a celebrity’s image is protected by the First Amendment and does not violate such celebrity’s right of publicity when the work using the image contains such transformative elements as parody, caricature, and other types of distortion as to create a new expression (in contrast to a literal depiction of such celebrity). Hallmark argues that the Card used Hilton’s image in a transformative way – placing an oversized photograph of Hilton over a cartoon body making her appear as a waitress (which Hilton apparently calls her own “private nightmare” in her Amended Complaint) with a dialogue that uses her catchphrase in a literal sense in describing the patron’s food. Finally, Hallmark cites the “public interest” as a defense to Hilton’s right of publicity claim citing Hilton’s notoriety and public figure status make her a fair target for Hallmark’s expression. With respect to Hilton’s allegations that Hallmark’s use of her name and likeness create a false designation of origin in violation of Section 43(a) of the Lanham Act (15 USC §1125(a)), Hallmark cites to several cases for the proposition that the First Amendment bars Hilton’s Lanham Act claim in much the same way it bars her right of publicity claim. See Kirby v. Sega of America, 144 Cal.App.4th 47 (Cal. App. 2nd 2006); ETW Corp. v. Jireh Publ’s, Inc., 332 F.3d 915 (6th Cir. 2003); Hoffman v. Capital Cities/ABC, Inc., 255 F.3d 1180 (9th Cir. 2001). Hallmark also argues that the “nominative use doctrine” protects Hallmark’s use of Hilton’s name and likeness (the mark at issue in the Lanham Act claim) which were used to express commentary about and parody of Hilton. The doctrine (sometimes called the “nominative fair use defense”) allows a party to use or refer to another party’s trademark if the product or service in question cannot readily identifiable without use of the trademark, the use is only so much as is reasonably necessary to identify the product or service, and the use does nothing that would suggest sponsorship or endorsement by the trademark holder. See New Kids on the Block v. News America Publishing, Inc., 971 F.2d 302 (9th Cir. 1992). Without commenting on the first two prongs of the test, Hallmark argues that its use of Hilton’s name and likeness, as a parody, did not suggest sponsorship or endorsement by Hilton. Finally, Hallmark argues that the likelihood of confusion test is inappropriate for expressive works that incorporate a trademark. Hallmark cites the Ninth Circuit’s decision in Mattel, Inc. v. MCA Records, Inc., 296 F.3d 894 (9th Cir. 2002), where the court found that the use of the term “Barbie” in the “Barbie Girl” song was not trademark infringement and was protected by the First Amendment because the mark was relevant to the work and the use was not misleading as to sponsorship or endorsement. Hallmark asserts that in the case of Hilton’s “image and likeness,” Hallmark’s use in the Card was artistically relevant and not specifically misleading as to sponsorship or endorsement. Furthermore, even if the likelihood of confusion test were applied to Hallmark’s use of Hilton’s “image and likeness,” the parodic nature of the Card is so obvious that it would not cause any consumer to believe that Hilton created the Card or otherwise endorsed the Card. Hallmark also adds that Hilton, as a public figure, fails to plead and prove with clear and convincing evidence that Hallmark’s use of her “image and likeness” was done with actual malice. Citing Hoffman, Hallmark argues that Hilton has not shown clear and convincing evidence that Hallmark intended to create a false impression in the mind of consumers that the image of Hilton on the Card was her or that Hilton was somehow endorsing the Card. With respect to Hilton’s allegations that Hallmark’s use of the word “That’s Hot” on the Card infringes Hilton’s registered trademark for THAT’S HOT, Hallmark reiterates most of the same arguments set forth to dispute Hilton’s false designation of origin claim. First, Hallmark’s Card is protected speech under the First Amendment, and Hilton’s allegation of infringement of the “That’s Hot” trademark is barred. Second, the use of the words “That’s Hot” is protected by the nominative use doctrine – such use was for parody and not to designate any goods or services or to serve as an indicator of source, sponsorship, or affiliation. Third, the likelihood of confusion test should not apply because the use of “That’s Hot” on the Card was artistically relevant to the Card and was not misleading as to suggest that the Card was sponsored or endorsed by Hilton. And even if such test were applicable, the obvious parodic nature of the Card would not cause any consumer to believe that Hilton created the Card or otherwise endorsed the Card. Finally, Hallmark adds that Hilton’s registration for THAT’S HOT does not cover greeting cards. When Hilton originally filed her Section 1(b) intent-to-use application, it included among various goods and services “paper goods” and “printed materials” (in Class 16). However, on September 9, 2005, in response to the USPTO’s office action dividing her goods and services into several different classes, Hilton chose to delete the Class 16 goods and proceeded to prosecute the application for various clothing items in Class 25, and which was the scope of the application when it ultimately registered on February 13, 2007. Hallmark summarizes its argument against Hilton very well early on in the Memo: “Hallmark’s Card parodies Hilton, her silver-spoon upbringing, her lavish lifestyle and her oft-repeated, vapid use of the catchphrase ‘that’s hot.’ Like the countless other parodies, comic strips and editorials that have taken aim at this self-described ‘cultural icon’ of society, the Card is fully protected speech under the United States and California Constitutions.” Memo at 2. Blackberry maker Research In Motion files trademark infringement lawsuit over LG Electronics’ “Black Label” cell phone. According to a report yesterday by Bloomberg (link here), on November 7, 2007, Research In Motion Ltd. (“RIM”), the maker of the widely successful Blackberry cell phone, filed a trademark infringement lawsuit against LG Electronics, Inc. (“LG”) in the U.S. District Court for the Central District of California, alleging that the name of LG’s “Black Label” cell phones is confusing similar to RIM’s BLACKBERRY trademark for its cell phones. See Research In Motion v. LG Electronics, Case No. 07-7323 (C.D. Cal.). In addition to RIM seeking an injunction to stop LG from selling its cell phones under the name “Black Label” and seeking the usual damages for infringement, RIM is also seeking an injunction to stop the sale of LG’s Chocolate handsets that Verizon Wireless apparently sells under the names Strawberry and Black Cherry (click here for story about these colors). This is not the first time Research In Motion has filed suit against a cell phone manufacturer over a cell phone with the word “Black” in it. On December 8, 2006, RIM sued Samsung Electronics Co. over Samsung’s “BlackJack” phones. See Research In Motion Limited v. Samsung Telecommunications America LP, Case No. 2:2006cv07797 (C.D. Cal. ); see also news stories here and here published when the Samsung lawsuit was originally filed. That case settled in February of this year. See news stories here and here. RIM and Samsung worked out a mostly-confidential settlement that allowed Samsung to continue to sell the BlackJack phone in the U.S. subject to some unspecified limitations to “help avoid consumer confusion,” but which also required Samsung to withdrawal its federal trademark application for BLACKJACK. RIM’s eagerness to corner the market on the use of the words "black" and "berry" (or other fruit) with respect to cell phones may have something to do with the fact that RIM last month announced that after years of bureaucratic RED tape, it had finally been granted permission to sell its phone in China where one of its competitors is the government-run telecommunications company, China Unicom, which operates its own wireless e-mail service called “Redberry.” (story link here). 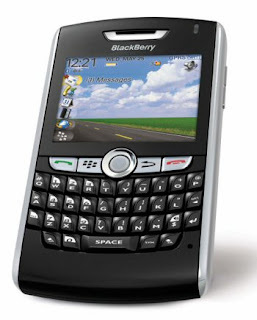 RIM may be trying to limit the number of cellphones out there using the words "black" and "berry" so that its cell phone (and the source of such cell phones) remain distinctive among the millions of cell phone users worldwide. If LG decides to take an aggressive stance, it may have the upper hand. 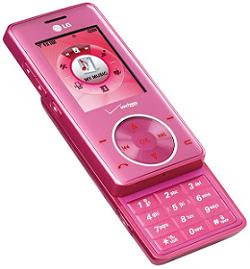 With respect to RIM's attempt to stop LG from selling its Strawberry (pictured above) and Black Cherry phones, given that the terms are usually used in conjunction with the word CHOCOLATE and the fact that the names are more descriptive of the color of LG’s Chocolate line of phones and not likely to be confused with the Blackberry. 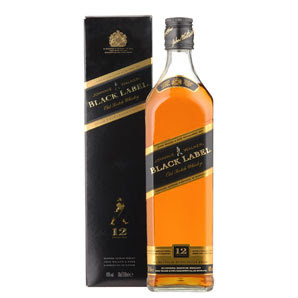 As for LG’s “Black Label” phone, the first thing that came to my mind was Johnnie Walker® Black Label Scotch Whisky. Given RIM’s track record, the company is likely to be more amicable to a settlement that will allow LG to continue to sell its phone but under conditions that RIM can claim will allow it to protect its Mark. RIM may also want LG tow withdraw its pending Section 1(b) intent-to-use trademark application for the mark BLACK LABEL. Of course, prosecution on Samsung's application had been suspended anyway by the USPTO pending the disposition of three other pending applications for the marks LABEL MOBILE, BLACK LABEL SOCIETY, and BURBERRY BLACK LABEL. Over the last two weeks, 3700 Associates, LLC (“3700 Associates”), the developer of the Cosmopolitan Resort & Casino in Las Vegas, has filed several trademark infringement lawsuits in the U.S. District Court for the District of Nevada against various defendants. See 3700 Associates, LLC v. Griffin et al, Case No 2:2007cv01453 (D. Nev. Filed October 31, 2007); 3700 Associates, LLC v. Roshni et al, Case No. 2:2007cv01459 (D. Nev. Filed November 1, 2007); and 3700 Associates, LLC v. Inter Wires, Inc., Case No. 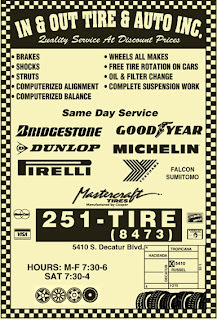 2:2007cv01460 (D. Nev. Filed November 1, 2007). Until yesterday, however, the nature of these lawsuits was not apparent (I apologize for not shelling out the $1 to download the complaint from PACER). But after looking at the named defendants in the trademark infringement lawsuit filed by 3700 Associates yesterday, one can take an educated guess at the nature of the lawsuits. On November 6, 2007, 3700 Associates filed a complaint against the following named defendants -- cosmopolitanhotelcasino.com, cosmopolitan-hotel.com, cosmopolitanlasvegashotel.com, cosmopolitanvegas.com and cosmopolitan-vegas.com. See 3700 Associates, LLC v. Cosmopolitanhotelcasino.com, et al, Case No. 2:2007cv01479 (D. Nev.). Without seeing a copy of the actual complaint, 3700 Associates appears to be going after domain registrants buying up domain names that are similar to the THE COSMOPOLITAN RESORT & CASINO mark. 3700 Associates announced the name for its hotel and casino project back on November 24, 2004 (click here for article announcing the name of the Cosmopolitan Resort & Casino). The day before, 3700 Associates filed several applications for federal registration of THE COSMOPOLITAN RESORT & CASINO word mark and stylized variation thereof: a) the word mark and stylized mark covering real estate services featuring condominiums (which applications are scheduled for registration in due course) and b) the word mark and stylized mark covering vacation time shares, casino services, and resort hotels (which have received notices of allowance and are awaiting Statements of Use). 3700 Associates was not as lucky, however, with some of its other pending applications for registration. When two of its applications for THE COSMOPOLITAN RESORT & CASINO were published for opposition (for restaurant and bar services and clothing), a notice of opposition was filed by Hearst Communications, Inc. (“HCI”), the publisher of the Cosmopolitan magazine and holder of several registrations for the mark COSMOPOLITAN. See Hearst Communications, Inc. v. 3700 Associates, LLC, Opposition No. 91177407 (T.T.A.B. Filed May 21, 2007). The consolidated opposition includes HCI’s opposition to several other pending applications filed by 3700 Associates which contain the word COSMOPOLITAN, including THE COSMOPOLITAN BEACH CLUB and COSMO BEACH CLUB. HCI argues that registration will cause confusion in violation of Section 2(d) of the Trademark Act (15 USC §1052(d)) and will cause dilution of HCI’s famous marks under 43(c) of the Trademark Act (15 USC §1125(c)). 3700 Associates’ answer to HCI’s opposition does not give any clues as to how the company plans to defend HCI’s allegations of likelihood of confusion and dilution. Getting back to 3700 Associates’ cybersquatting lawsuits, the lawsuits likely resemble the lawsuit filed by Las Vegas Sands Corp against a Venetian cyber squatter (Vegas™Esq Blogged here). 3700 Associates is likely arguing that the defendants are violating Section 43(d) of the Lanham Act (15 USC §1125(d)), which holds a registrant liable if the registrant (i) registers, traffics in, or uses a domain name that a) is identical or confusingly similar to a distinctive mark or b) is identical or confusingly similar to or dilutive of a famous mark and (ii) has a bad faith intent to profit from that trademark, including a personal name, which is protected as a trademark under Section 43 of the Lanham Act. See 15 U.S.C. § 1125(d)(1)(A). And given that the defendant domain name registrants are not even attempting to use the registered sites (they are being parked by GoDaddy and protected by the company’s private domain registration), 3700 Associates is likely to be successful in arguing the “bad faith intent to profit” and obtaining an order to transfer the domains at issue. I cannot write about the Cosmopolitan without providing a link to my favorite Las Vegas real estate agent. If anyone is interested in purchasing a Cosmopolitan condominium (or any real estate in the Las Vegas area), please check out her website. Tell her the “Vegas Trademark Attorney” sent you.